I had a momentary freak out recently following my 28th birthday. It’s 2013. I graduated from high school in 2003. By my count, that means I’ve been out of high school for 10 years. Oh, no! Ten year reunion! I can’t be that old, can I? Thankfully no invite for said reunion has come in the mail so I can calm down a little for the time being. In the meantime, I can watch other people struggle through the same issues in “10 Years”. A moderately successful mortgage broker, late 20s Jake (Channing Tatum) is pleased with where his life is if not completely pleased. 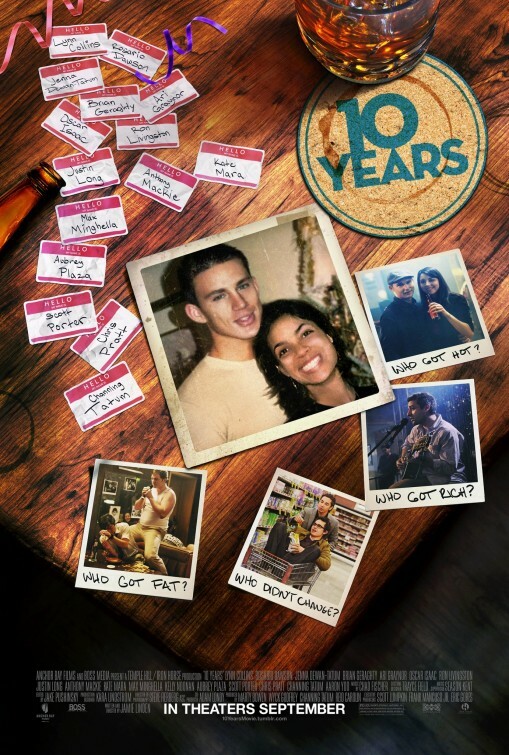 He’s got a good if safe job and a smoking hot longtime girlfriend, Jess (Jenna Dewan-Tatum), so when his 10-year high school reunion pops up, Jake is both excited and nervous. His former classmates are similarly descending on the town back home, coming from all reaches of life, some more successful than others, but they seemingly all have a goal at the reunion. Just catching up with old friends, in some cases hooking up with former classmates, making apologies, or even bringing closure to certain things. The jocks, the nerds, the cheerleaders, the popular kids and the smart kids, they’ve all grown up to some point. For Jake though, he’s most worried about seeing his ex-girlfriend, Mary (Rosario Dawson), and what she’s up to after a tough breakup for the both of them. The reunion promises to be very interesting for all involved. For starters, let me clear things up. I needed something remotely coherent for the plot description so I streamlined things…a lot. While dreamy Channing Tatum is in the movie a lot, he’s merely a part of a very strong ensemble cast. So that’s it. This isn’t his movie on his own. Okay, now that we’ve got that out of the way, let’s move on. 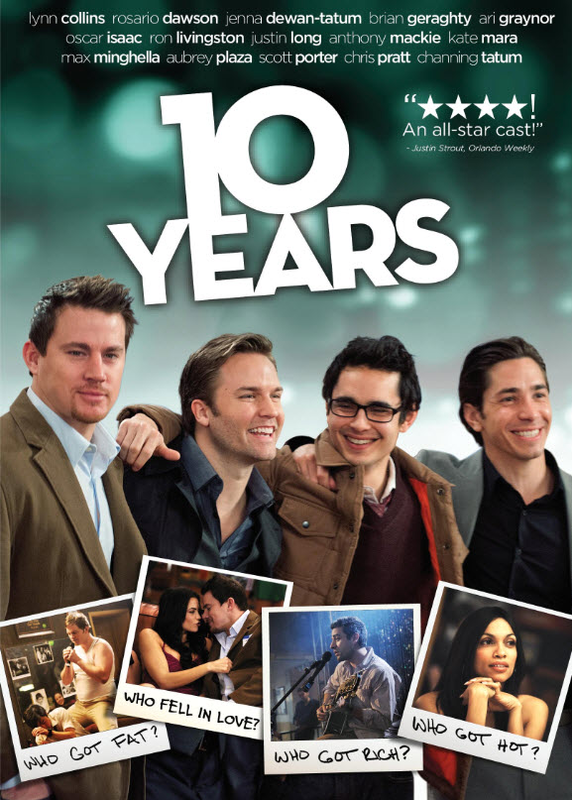 “Years” comes from first-time director Jamie Linden, who has worked previously as both a writer and producer. It’s a more than solid debut, showcasing an ease with the script and talent that should bode well for Linden’s future films. Reunion movies can be pretty common from the lousy “American Reunion” to “The Big Chill” and plenty in between, but Linden’s film has a nice, easygoing charm about it. The IMDB rating is currently at 6.0 (low, if you ask me), so naturally I liked it and am now assuming I missed something about it. Writing the script and directing his feature debut, Linden does a really solid job sticking with what works in the reunion genre but managing to keep it fresh. He throws a lot of characters together, some more familiar than others, and lets them do their thing. The beauty of having so many characters is that we get to run the gamut of high school all over again. We do see all those dreaded high school cliques from the jocks, bullies and nerds to the cheerleaders, hot chicks and loners and everything in between. The movie runs 100 minutes and is basically moving along non-stop, flitting around all the characters and their issues. As is the case with any ensemble, some are more interesting than others, but most importantly, none of them are dull. From the reunion to the post-reunion booze fest at a local bar, it’s a lot of fun to watch. Again proving me wrong after years of doubting him, Tatum seems right at home as Jake, the former jock who’s now in a good place but always worried what could have been with Dawson’s Mary (now married to the older Ron Livingston). Dewan-Tatum, Mrs. Channing Tatum, is good too in a part that avoids clichés for the most part as the worrying girlfriend. My favorite parts were Justin Long and Max Minghella as Marty, a successful publisher in NYC, and A.J., his equally successful friend struggling with some issues. They have a believable friendship, one that goes through its ups and downs as A.J. tries to “wingman” it for single Marty. I also especially liked Chris Pratt as Cully, the former bully now trying to apologize to all the then-nerds he terrorized in high school (including a very good Aaron Yoo) with Ari Gaynor as his wife, Sam, who he has two kids with. Sam wants to enjoy herself too, not just watch over Cully embracing his high school craziness. Not enough young talent for you? There’s plenty more. Oscar Isaac is Reeves, who’s recently gained a lot of popularity across the country as a pop star musician, but he just wants to talk to Kate Mara‘s Elise. It’s a decent subplot, but probably the weakest of all the stories. Isaac and Mara are good, it’s just not as interesting. Scott Porter plays Scott, a globe-trotting happy-go-luck guy with his wife, Suki (Eiko Nijo), who he met in Japan. Anthony Mackie as Andre is just looking to have some fun, especially when he sees Garrity (Brian Geraghty), a white guy who thought he was black in high school, news to his wife (Aubrey Plaza). There’s also Lynn Collins as Anna, the hottest girl in high school, Marty seeing if he can make up for lost time with her. No point in analyzing this one too much. A fun, cute reunion story with a good mix of laughs and comedy with some actual sympathetic human emotion. What a novel concept! I especially liked the cast and feel very comfortable recommending it.